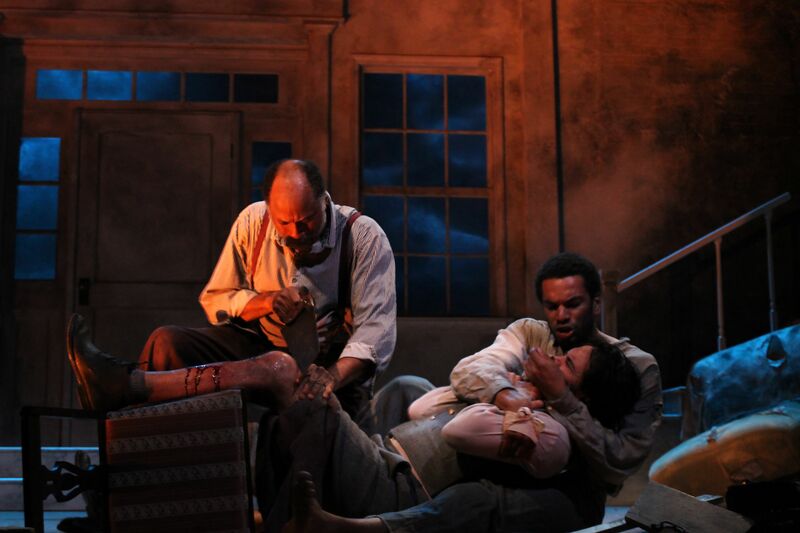 THE WHIPPING MAN, the intense civil war era drama currently on the Gulfshore Playhouse stage, is playwright Matthew Lopez’s first play. In the growing popularity of this touching play, Lopez himself is receiving more and more attention. Gulfshore Playhouse had the honor to interview Lopez, read below to see his insights into the play itself, the themes it touches on, and what new endeavors he is taking on. What was the genesis for writing THE WHIPPING MAN? I wanted to write about the uncharted territory of a post-Civil war America, the period immediately after the calamity. I’m fascinated by life returning to normal after upheaval. That is usually the part that history books and fiction skip over. You’re told to look for the big events. I wanted to set a play after the big event had already happened and see how three very different yet deeply intertwined people respond to that event. What made you want to tackle the rather large themes that are brought up by evoking this particular piece of American history? It’s impossible to write about American history without touching on large themes. Our nation lends itself to metaphor. So in some ways, I had no choice. But insofar as I did have one, I did want to wrestle with a big idea but in a compact, intimate and personal way. I’m a huge fan of epic historical theatre. Tell me I’m about to sit through THE KENTUCKY CYCLE or COAST OF UTOPIA all day long and I’m a happy man. But there’s something uniquely challenging about writing a macro story in a micro setting. At the end of the day, it’s about 3 guys in a room, hashing it out. That made it feel less daunting: to focus on the men in the room and not the enormous world outside the room. With the success of THE WHIPPING MAN over the last few years, and with it becoming one of the top ten produced plays in America this season, what has it been like for you to watch your play that is very much rooted in a specific time and place travel across the country? Every single rejection this play ever received (and it received a lot) mentioned the fact that audiences wouldn’t want to see this story, that the historical context would keep them from engaging emotionally and no one really cares about the civil war anymore. I’m very happy to discover that those letters were wrong. (For the record, several of those letters are from theatres that have produced the play in the last two years.) What I am mostly gratified by is the knowledge that audiences all over the country, in different regions and cities are having an experience with this story and with these characters. It is incredibly humbling. I’m also very grateful that each production of this play means a job has been created for a middle-aged black actor and a younger black actor. As someone of color who used to be an actor, I know full well how rare those opportunities are. Have there been widely different audience reactions to the play in different areas of the country? What the hell is this crazy play? I don’t think I want to see this. Plays about the Civil War are boring. Jewish slave-owners? Jewish slaves? I don’t believe it. My friend at work just told me she really liked it. Okay, maybe I’ll go see this crazy play. I still don’t think I’ll like it. Oh my God, what a beautiful set. But it looks depressing. I wish I hadn’t bought a ticket. This is going to be agony. I need to try a new temple. My rabbi clearly doesn’t know what he’s talking about. Oh. This is interesting. What’s happening? I want to know more. OMG, they cut off his leg! This is nuts! Wow, it’s funnier than I thought it would be. Wow, I really care about these characters. No, I don’t want to leave at intermission. Wow, that was amazing! I’m telling my friends to go see it. When a script goes to print, the playwright’s job is ostensibly over. You have moved on to several other writing projects as THE WHIPPING MAN continues to live out its life on stages. How has your relationship with this play evolved? It’s true that my work here is done. I had that feeling most acutely when I saw my first production post-NY, which was in Philadelphia. It was a pleasure to watch the show and not have any responsibilities. I could watch the play as an audience member. As I grow as a writer, I learn things that might have made the writing process of THE WHIPPING MAN easier and faster but I don’t think it would have helped me write a better play. I’m very proud of this play. I’m very proud that it’s my first play. I’m very proud that, despite an overwhelming chorus of nay-saying, I persevered and didn’t give up on it, even at times when I probably should have. It has been an enormous blessing in my life. It has introduced me in a way I could never have imagined. It has provided me with a good income for the last several years, allowed me to to work from a place of confidence, rather than a place of fear. No matter what I do in life after this, I will always be proud of this play. But I’m also beginning to put some distance between myself and it. I’m not going to as many productions this year as I did last year. I’m learning to put it away for now and move on. But the satisfaction and the gratitude are ever present. One of your more recent achievements is becoming a writer for Aaron Sorkin’s THE NEWSROOM. How has the experience been for you as you add writing for television into your schedule? Well, it’s provided me with an impressive amount of frequent flyer miles, that’s for sure. Television isn’t so much something that you fit into your schedule as you clear your schedule for but I’ve been very lucky to have the freedom to take time to attend to my theatrical career as we work on the show. As with anything in life, it’s a balance. I’ve never been busier in my life. I’ve never been more tired in my life. But I’ve also never been so excited and productive in my life. I figure I’ll just embrace it in all its madness for one day I’ll likely be fighting for attention again. This will be a happy memory when that time returns. What are the main differences in writing for stage and writing for television? The time. Whipping Man has been a part of my life for nearly a decade now, in one form or another. It’s taken up a full quarter of my life. On TV, you have an idea for an episode, the episode gets written and a week later, it’s in front of the cameras. The relentless pace of it drives the process. Theatre is a much more gentlemanly endeavor (and I don’t say that to suggest it’s just for boys!). I also love the opportunity to watch a character grow and develop over the course of an entire season, rather than just the course of a play. WHIPPING MAN is 2 hours long. THE NEWSROOM is 10 hours long. It’s a different muscle to bring a character through a life-changing experience in 2 hours than in 10. But in many ways, doing it in 10 is so much harder because you have so many options to choose from. Also, the food’s much better in television.